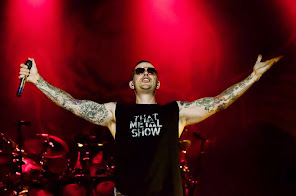 Avenged Sevenfold News: Avenged Sevenfold's M.Shadows: "In terms of writing, we had it as a solo in our show, then we..."
Avenged Sevenfold's M.Shadows: "In terms of writing, we had it as a solo in our show, then we..."
The music for the game is more instrumental. Can you talk a bit about how you came up with the individual themes for the game itself? We were looking at a lot of landscapes. We were doing walk throughs on a lot of levels and a level like Bat Country, which is obviously a desert — we wanted more of an Egyptian theme. We thought back to ‘Mario III’ and we thought back to the scene in ‘Super Mario World’ where there’s caves and bat country. People will see that. We were just looking at the environments and then just imagining what we want that landscape to sound like. In terms like, things like the Nightmare Theme, that thing has been floating around forever. In terms of writing, we had it as a solo in our show, then we played it at countless shows as a jam session — what that came from was actually a ‘Hail to the King’ sessions where we wanted to keep all the classical stuff of that record. We were trying to make a blues record. So we had a lot of stuff that we naturally kind of go towards in terms of dueling guitars and just those lead guitars where they do all the duals. They’re stuff that wasn’t able to make the record. So we took that and transformed it into video game soundtracks.